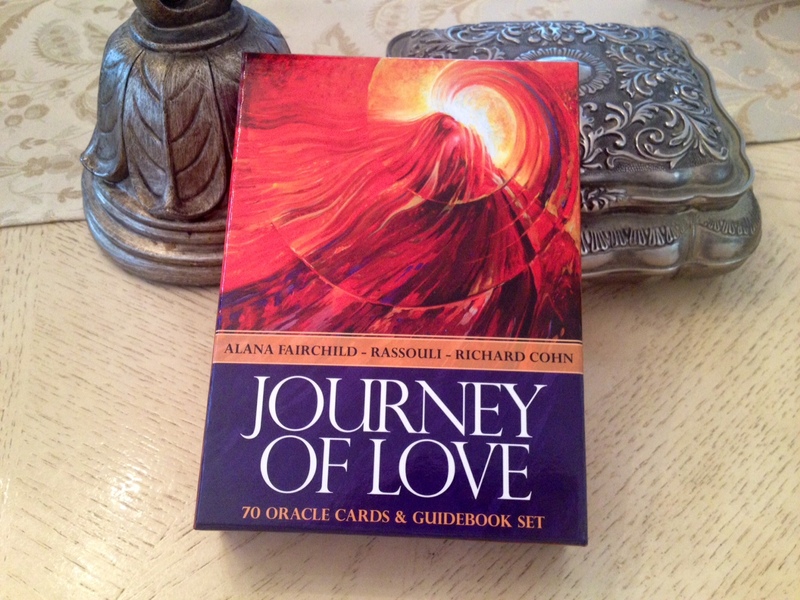 The Journey of Love oracle deck by Alana Fairchild and illustrated by two artists, Rassouli and Richard Cohn, was published by Llewellyn (Blue Angel Publishing) in 2014. It’s printed in the same style common among modern oracle decks right now, with the larger dimensions, sticky high-gloss finishes, and vibrant contemporary art. There are 70 cards in total, along with a sizable perfect-bound guidebook. Alana Fairchild has rapidly ascended to the top of the New Age Movement. She is based out of Australia and is the bestselling author/creator of guided meditation CDs, books on angels and crystals, etc., and exquisite oracle decks that tend to be inspired by the divine feminine. 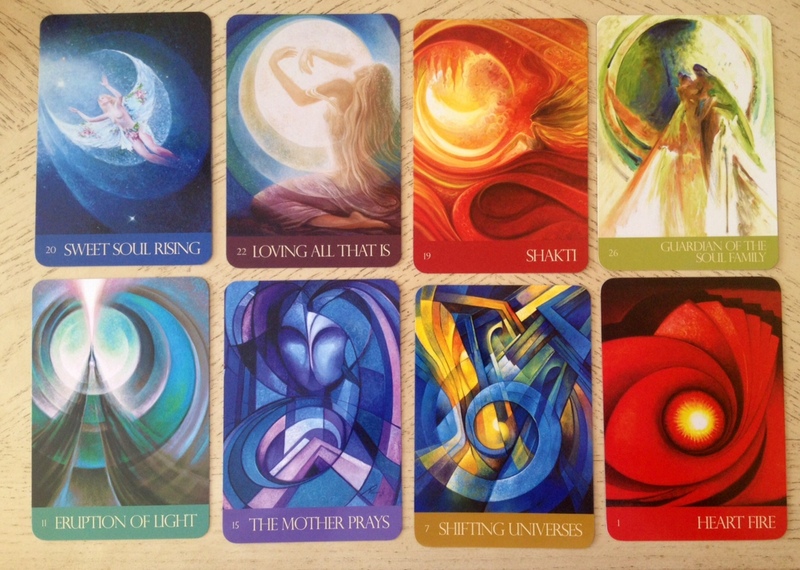 There’s the Kuan Yin Oracle deck, the Isis Oracle, Mother Mary Oracle, and Sacred Rebels, among others. I have the Kuan Yin deck (my review posted here), this one, and the Sacred Rebels (review forthcoming). 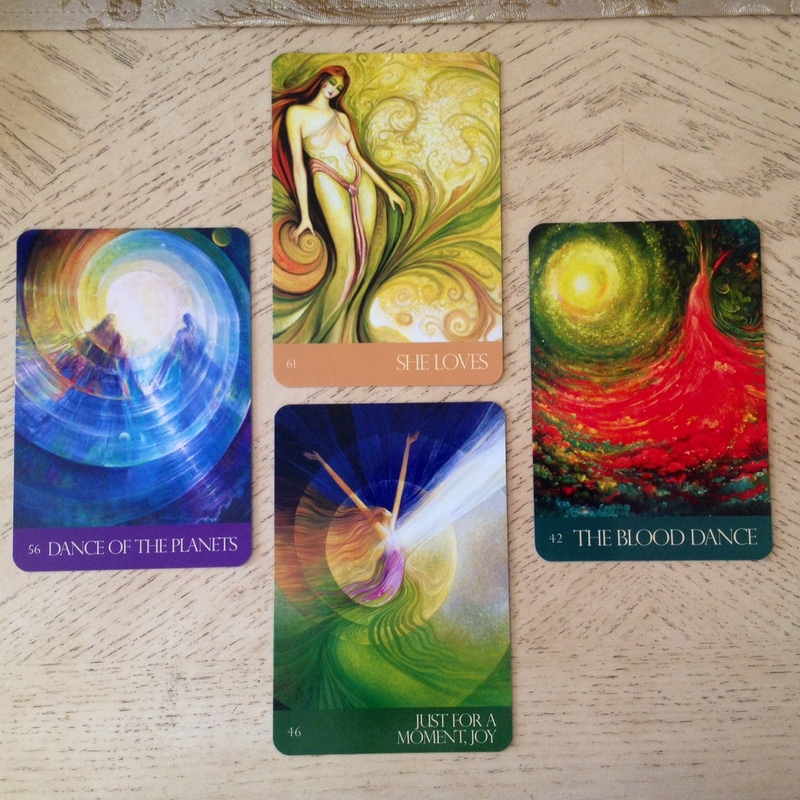 I love the Sacred Rebels deck, like, a lot, but I might actually love this one, the Journey of Love oracle more. 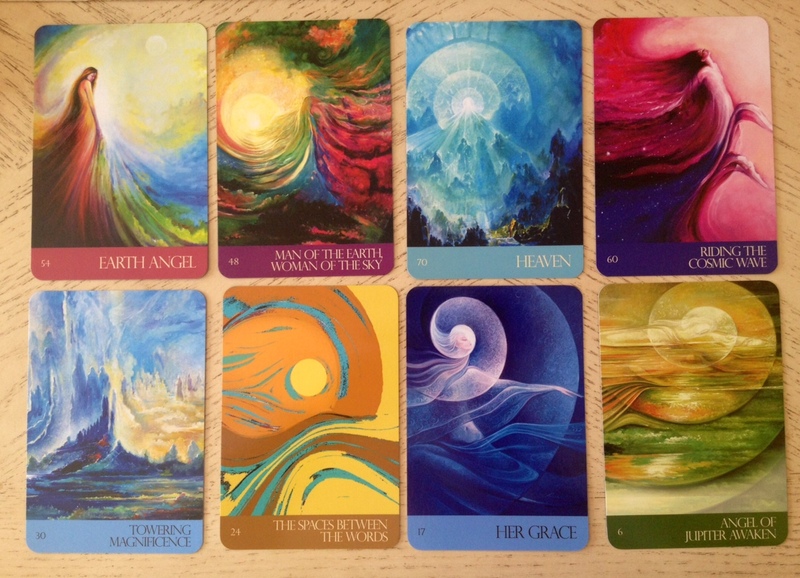 The cards are painted in vibrant colors, with soft, curved silhouettes, and evocative of the chakras. Along the bottoms you’ll see a number and a short phrase. A synthesis of the artwork and the keywords trigger your intuition and help you reach certain divinatory realizations about your question. When reading for myself with this deck, I’ll look up the corresponding card meaning entry in the companion guidebook. 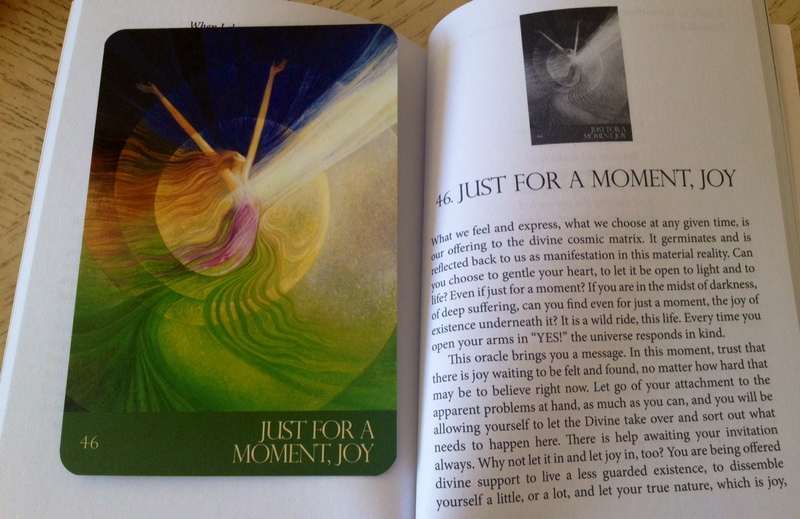 Fairchild’s oracle decks all come with great, comprehensive, perfect-bound guidebooks. It seems standard with Blue Angel Publishing. While you can certainly use spreads for this deck, I don’t. I mean, I don’t really use them for serious divination readings. Instead, I’ll ask a mundane question and pull a card. These Fairchild oracle decks are also fantastic for the “card of the day” social media posts (#cotd or #cardoftheday). I also like pulling a card at the close of a tarot reading. 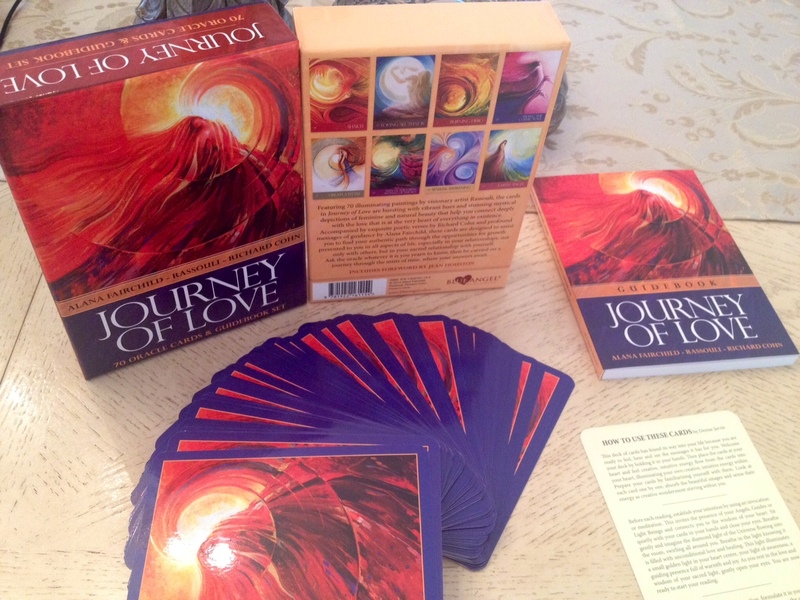 For that last noted purpose, the Journey of Love deck is fantastic, and so I do recommend it for professional readers. It’s a great way to conclude a love and relationships reading. Much of the art is in a contemporary fantasy impressionist style. I’ve also heard the style referred to as spiritual art. Rassouli, one of the artists, is an Iranian American visionary or conceptual artist, and refers to his style as Fusionart. He works with oils on canvas. Richard Cohn is the other artist on the deck, though I couldn’t find much info on him. Distinct artistic styles really come out and are obvious in this deck, though it doesn’t really bother me since I don’t read with spreads and mostly pull and read one card at a time. 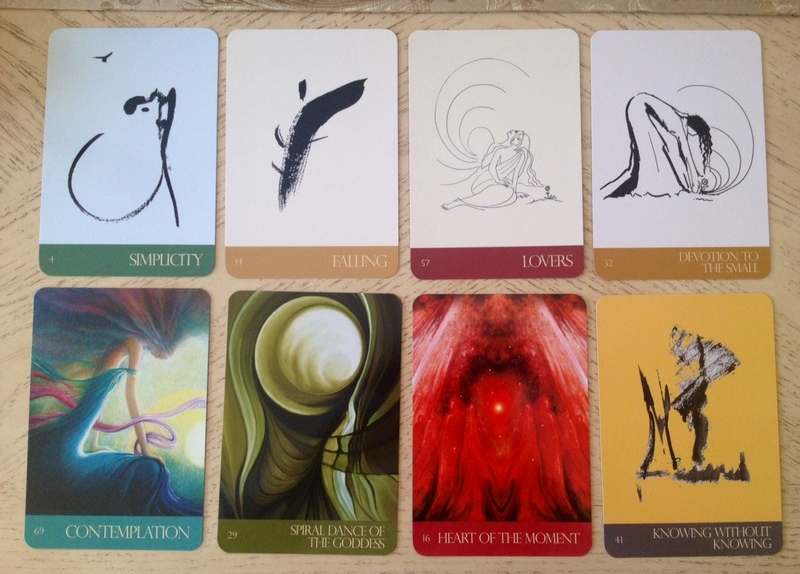 In the first row of cards pictured above, the style is very abstract-zen, for lack of a better descriptive. I do like the inclusion of the few black and white ink brush paintings, though. All right. Let’s see how the deck reads for you. Do not scroll down. Stay on the above photograph, ask an open-ended question, and choose one of the cards: top, bottom, left, or right. Once you’ve chosen a card, scroll on. Note the card you selected. I’ll be providing sample photos of the guidebook entries and you can assess how well the cards read for you and whether this deck resonates with you. Top Card: If you chose the top-most card, your card is No. 61, “She Loves.” You can click on the below photographs for a larger viewing. This is a card of forgiveness. Let go of your regrets and, at least according to the guidebook entry, let yourself be loved by the divine goddess of forgiveness. Right Card: If you selected the card on the right, your message is from No. 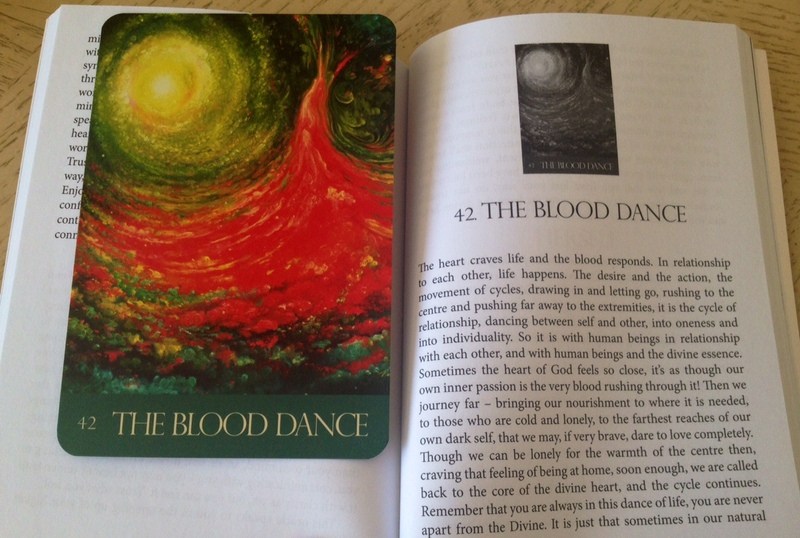 42, “The Blood Dance.” The theme here is passion. Raise the energy of your inner fire. I read this card as an affirmation to give in to your red-blooded nature and embrace the verve of life. Left Card: The card on the left is No. 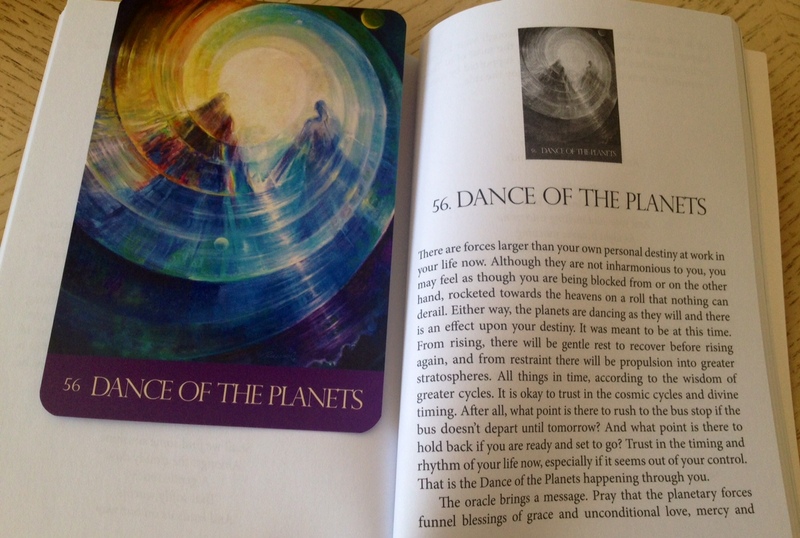 56, “Dance of the Planets.” Greater forces are at play in your life right now, which is probably why things feel beyond your control. Instead of trying to push against the current, embrace the current, embrace change, and be in harmony with the natural cycle. Bottom Card: The bottom card is No. 46, “Just for a Moment, Joy.” There’s a Three of Cups vibe here. Celebrate. Enjoy the moment. Feel the joy of living again. Let to of stress and your material attachments. Just enjoy the breath of life. As you can see, the messages are all very light, very loving, very soft, with lots of references to the divine feminine, the Divine in general, and Spirit. Generally these are welcoming messages for concluding a professional tarot reading, but I would probably not use this deck exclusively in a reading. It’s a great deck to have if you read for yourself or like to pull daily cards. I’ll be real here–this is a phenomenal deck for taking Instagram photos and doing vague readings for the nameless, faceless public; but as a serious reading deck, I’m a bit doubtful. All the messages are so positive and uplifting, so soft and sweet, that they’re really best for a light pick-me-up than for esoteric work or divination. Overall, I am happy to have this deck and I do reach for it quite often. 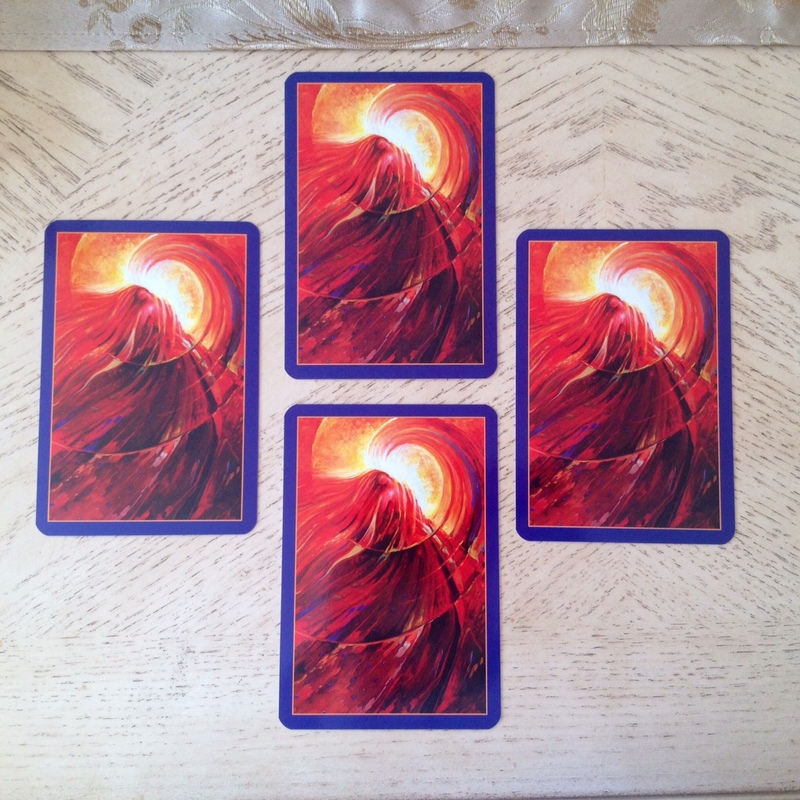 They really are fantastic for social media pics of daily card draws and on a slightly more serious note, do serve the practitioner well as a positive and uplifting end note to a professional tarot reading. If the art captivates you, then get this deck. If you need an oracle deck for love and relationships readings to uplift your clients, then get this deck. These warm, spiritual messages and evocative conceptual art are a great way to start your day, or end your day. Fairchild infuses her oracle decks with emotionally and spiritually warm vibrations that you can’t not connect to. Letting those vibrations into your practice is definitely positive and constructive. Of all her decks to date, I think I may like this one, the Journey of Love Oracle, the best. 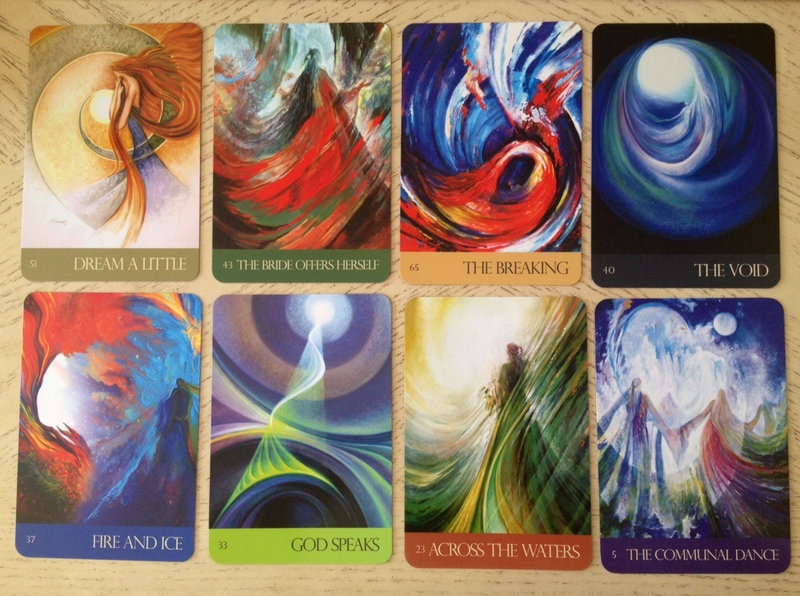 Your idea for using an oracle deck as a conclusion to a reading is a really good one. I love the look of this deck, Benebell. Thanks for another fabulous review.. Nice!! I really loved the interactive card reading here! Lovely deck! I’ve got soooo many decks on my Amazon wish list because of your blog!! LOL!!! “Just for a moment joy!” Wonderful review. Thanks! I’ve only started using oracle decks last year or so and I find most of them difficult to use as divination tools so to speak. I feel like they’re often like you say “pick me ups” and inspirational and comforting, but I hardly ever do spreads with them, I much prefer doing a daily draw asking something like “What is the message I need for today?”. But I definitely find my oracle decks “accurate” because I always get the message I really need! The oracles always manage to pick up the emotions or thoughts I’m struggling with. I think I mostly see them as mirrors of my emotional and spiritual state, but I wouldn’t ask what I would ask tarot, for example “How will my career develop in the coming month?” or “How can I work out the argument I have with X?”. Oracles to me aren’t as practical as tarot is. This is a lovely oracle. I really like how you’ve included sample DIY readings as part of your review. I may try out that technique on my own blog. Do you need to get permission from the author to do this? Are they more of a fantasy spiritual feel? I love this deck because it is so heart centered. Tarot can be harsh, that is why I layer in orcal cards for a deeper explanation to feelings/themes playing a role in the situation as well as the energy that needs to be used to get over challenges. 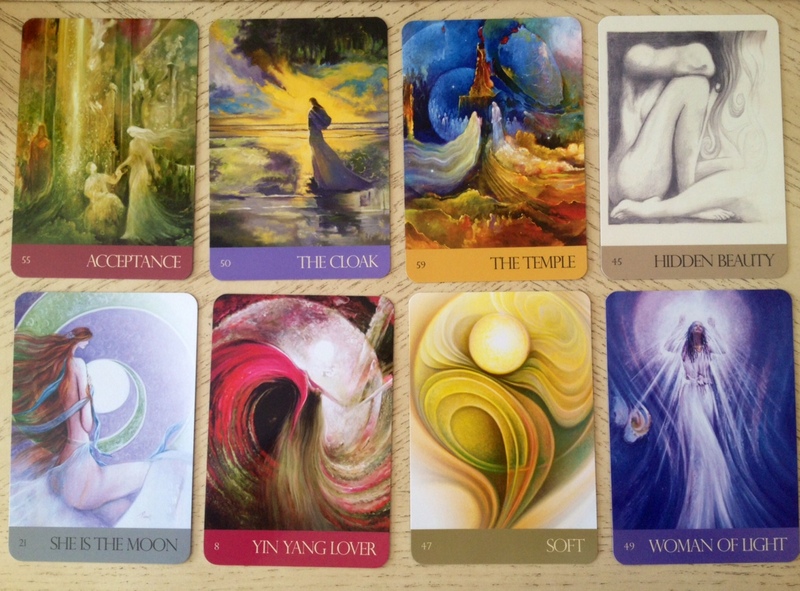 This is a beautiful deck and definately has a place in serious readings.